The story of Fight Night 2004 is straight out of a boxing movie. It entered the ring last year out of nowhere and without a lot of hype, but its excellent gameplay and innovative control system soon had gamers crowning it the king of boxing games. And just like a boxer in a sequel, the game has spent some time bulking up and now returns with more punch than ever in Fight Night Round 2. OK, enough of the loose analogies to Rocky without mentioning its name (d’oh! ), let’s take a look at what makes the game so good. 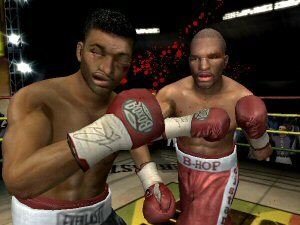 One of the major things that set Fight Night 2004 apart from every other boxing title before it was its Total Control punch system and this innovative scheme is at the core of Round 2 as well. For those of you new to the series, the Total Control system makes use of the right stick for punch control. Quick punches such as jabs are thrown by flicking the stick – move it left to punch with your left and right to punch with your right. Harder punches require some movement with the stick that mimic the motion that a fighter must use to throw each punch. For example, to throw an upper cut you bring the stick down and then rotate it up. Hold down the left trigger while throwing your punch and you will throw body blows. Combined your punches with movement of the left stick and you’re making punches from the sides or up out of a crouch. The system is simple, elegant, and surprisingly intuitive. The graphics almost bring the pain home. New to Round 2 is the haymaker punch. The haymaker lets you use the stick to wind up and let loose an extra powerful blow. Unfortunately this addition to the repertoire feels more like a gimmick than an extension of the fighting system. The haymaker is not a very smart boxing move as it leaves you open to a faster punch and it doesn’t land often enough to make it effective over the course of the bout. In Round 2, the punch is a bit too devastating and the penalty for being beaten to the punch seems too light. One of the things that makes the punch system in the game so good is that you actually need to think about which punches to throw and when. If you simply try to flick the stick around as fast as you can you are going to end up with your back on the canvas time and time again. You need to know when to strike and when to block, when to back away and when to clench your opponent. If you didn’t realize that there was a lot of strategy involved in the sport of boxing, then you’ll learn that fact really fast. Your opponents in the game know how to set-up more powerful punches, counter-punch your attacks, and anticipate punches that you’ve grown to rely upon. It makes for some tough competition, especially when you start facing the better boxers. You can take on the persona of any of a number of famous fighters from the past thirty years or so and battle it out in a full match against another marquee boxer. You can mix weight classes if you’d like to see how a smaller boxer would fair against a heavyweight. This match is a lot of fun, but the heart of the game lies in its career mode. You begin the career mode by creating a boxer using the game’s extensive set of tools. You have control over facial features, skin tone, size, and more, so you’ll be able to come up with a pretty good virtual likeness of yourself if you’d like. You also can customize your boxer’s style through the distribution of skill points to different attributes such as speed, power, and agility. If you’d prefer, you can take on the persona of a famous boxer and see if you can achieve the same success the fighter did in real life. You can even tweak the stats for famous fighters to see how they would have faired if things were a little different, such as creating a Mohammed Ali with no power but all speed. Not only is the look of your boxer completely customizable, the look will change as your career progresses. Spend time training and flab will begin to melt off of your body. Reach the twilight of your career and your boxer will show some of the typical signs of an aging athlete.